The kings and queens of Korvosa have long ruled under the shadow of the Curse of the Crimson Throne - an infamous superstition claiming that no monarch of the city of Korvosa shall ever die of old age or produce an heir. Whether or not there is any truth to the legend of the curse, Korvosa's current king is but the latest victim to succumb to this foul legacy. Now, the metropolis teeters on the edge of anarchy, and it falls to a band of new heroes to save Korvosa from the greatest threat it has ever known. 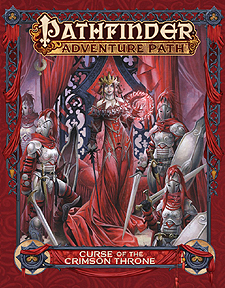 This hardcover compilation updates the fan-favourite campaign for use with the Pathfinder Roleplaying Game, including new and revised content and nearly 500 pages packed with mayhem, excitement, and adventure.